Social Media Outraged After Media’s Negligence Concerning Berlin Terror Attack! Check out what the "politically correct" media won't tell you. The dreadful news regarding the on-camera assassination of the Russian ambassador had hardly kicked in, when news regarding another potential terror attack in Berlin has left people completely shell-shocked. 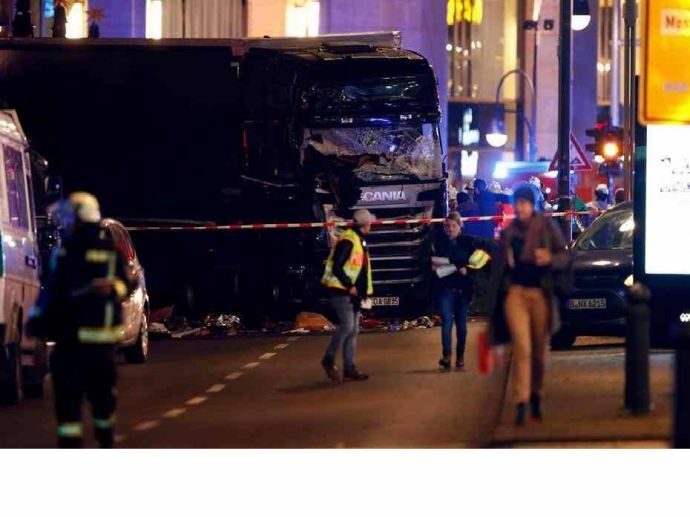 A truck-driver reportedly rammed his truck through a busy street in a Christmas market, killing 12 pedestrians and recklessly injuring around 48 people. Moreover, the reason this attack is doing rounds around the news, is its uncanny resemblance to the attack that happened in France this July, where a ‘truck’ wreaked havoc by killing almost 87 people. The truck driver behind this attack is reported to be a Pakistani refugee. The most bizarre thing concerning this attack is the way media is strategically framing this news by stating it as a mere truck ‘accident’ and negating any links whatsoever of being a terrorist plot. CNN who broke the news finds itself in the middle of another controversy, where they recently faced spleen after reportedly leaking questions to US Presidential candidate Hillary Clinton. They hate and kill us. We need a political revolution. What the politically correct media WON'T tell you about the Berlin Christmas market attack. #BerlinAttack Pakistani Refugee hijacks truck, murders Polish driver, kills innocent people and @BBCNews still pushes the #accident angle ??? ?